Brighton Games in Brighton are taking place in Falmer, a short distance from Brighton and Hove. The stadium has been constructed at a cost of 93m and according to the Rugby World Cup Official Website the ground has won plaudits for its semi-circular stand roofs and tubular supporting steelwork from both fans of sport and architecture. Brighton Dome is situated a stone's throw from the Royal Pavilion at the heart of Brighton's Cultural Quarter. Originally built as the Prince Regent's royal riding house in 1805, Brighton Dome combines the best of Brighton's past, present and future. An impressive and flexible setting for any conference or event, the venue boasts both Grade I and II listed heritage and is part of the famous Royal Pavilion estate in the heart of Brighton's cultural quarter. With five flexible spaces under one iconic roof, Brighton Dome is one of the most versatile and stylish venues to hire in the South. Conferences UK have over 45 meeting venues listed with almost 80,000 meeting rooms to choose from in the area. Leeds Leeds is set to host two pool matches on September 26 and September 27, 2015. The city has a long association and passion for Rugby Union, so Leeds is set to come alive for the duration of the tournament, with an exciting fanzone in the heart of the city, Rugby Union heritage tours at Headingley Stadium and amazing food and drink experiences created especially for rugby fans. Temple Newsam House and Estate boasts a Tudor Jacobean Mansion set within 1500 acres of beautiful parkland including a rare breeds farm. It offers a unique and flexible location if you are looking for somewhere special for your meeting, training session or team away day. Conferences UK have currently have over 98 meeting venues listed in Leeds, meaning there are around 167,000 meeting rooms to book in the area. Gloucester Gloucester is set to welcome the world to rugby and to Kingsholm Stadium in 2015, with no fewer than six different teams coming to the town during the event. St Michael's Tower at Gloucester Cross stands on the highest part of the city of Gloucester where the four main streets cross. Some 25 metres in height it was built in the footprint of the nave of a previous church dedicated to St Michael the Archangel. It was built c.1465 and has been a familiar sight to Gloucestrians for nearly 550 years, throughout the reigns of 23 kings and queens. Conferences UK have 45 venues listed in Gloucester, making just under 40,000 meeting rooms available for hire in the area. Leicester Leicester will host three matches at Leicester City Stadium In addition to hosting the matches, the King Power Stadium is a truly flexible business and entertainment venue, incorporating 10 Function Suites, Ground Floor Exhibition Space, Restaurant, Sports Bar facility and On Site Express Hotel. Set in the heart of the Midlands with excellent transport networks and ample car parking for all guests. The stadium can cater for a range of events from a small meeting for 5 or a major conference for 550. Conferences UK currently list 62 venues which offer 96,000 meeting rooms in the city. Manchester Manchester City Stadium has been announced as a host venue for the Rugby World Cup 2015, and will be the only stadium to stage an England game outside Twickenham. On 10 October, the home of the Blues will be packed with England fans cheering on their team as they seek to qualify for the tournament's knock-out stages. The city is home to two amazing venues, Manchester Central and Event City. Conferences UK currently featurest 181 venues and over 400,000 meeting rooms in the Manchester area. Cardiff Millenium Stadium The Rugby World Cup 2015 (RWC 2015) is coming to Cardiff's Millennium Stadium in Sept/Oct 2015. The city is hosting eight matches in total, including six pool matches and two quarter-finals. With a total of seven suites, accommodating up to 300 delegates, the stadium is a flexible venue for conferences, exhibitions, meetings, dinners, weddings and themed parties. The 124 Executive Boxes overlook the hallowed turf and can cater for smaller meetings or perform well as training rooms, break out space and intimate dining venues. While Cardiff itself has over 61 meeting venues and 144,807 rooms. London As you might expect London features heavily as a host city for the forthcoming world cup, with three venues hosting games. These venues include the Olympic Stadium, Wembley Stadium and Twickenham which with 25 dedicated meeting and conference rooms offers a state of the art modern and flexible meeting space for all conferences and events. With thousands of venues listed, including, Hilton London Heathrow Terminal 5. Confereneces UK can offer a range of meeting solutions in the capital city. Exeter Sandy Park Exeter securing approval to be one of the Host Cities presents a once in a lifetime opportunity for the city. 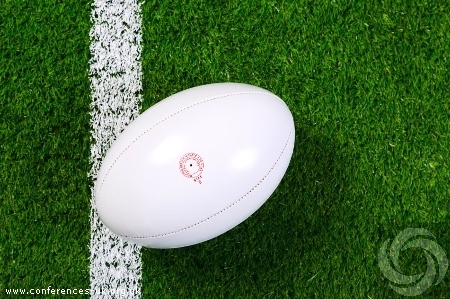 Three Rugby World Cup 2015 matches will be held at Sandy Park, which is located just outside Exeter with a capacity of 12,300. It has recently undergone a multi million pound makeover in 2014, almost doubling the size of the conferencing facilities. Sandy park is just one of 41 meeting venues listed for Exeter with 58,000 meeting rooms available currently. Newcastle Hosting three games in October, St James Park, is (outside of London) the second largest stadium in England. The stadium is also an award winning conference venue with seven meeting rooms and the ability to host up to 450. In addition to first class venues such as Jesmond Dene House Conferences UK lists 73 meeting venues, with over 130,000 meeting rooms. Milton Keynes Stadium MK, will host three games during the rugby world cup. Normally the home of the football team Milton Keynes Dons, the stadium has recently had its capacity expanded by 10,000 to enable it to seat over 30,000 ruby fans at the forthcoming world cup. For conferences and events, the stadium offer 5 meeting rooms, with a maximum individual capacity of 1,200. The city is home to many great meeting venues including Abbey Hill Hotel and 40 other venues offering 80,126 meeting rooms. Birmingham Home to Aston Villa football club, Villa Park with host two matches in late September. With a match day capacity of over 42,000, the stadium has recently benefited from refurbished function rooms. There are now over 20 meeting rooms available and the venue can accommodate up to 700 delegates. Birmingham central location makes it ideal for meetings and conferences. Currently there are 183 venues listed on Conferences UK and this means there are over 348,301 meeting rooms to choose from.